Fruits are those delicious stuffs which are sour, sweet, fleshy, juicy, tart and tangy too. It is regarded as one of the finest edible to be consumed. Being rich in fibres and other nutrients; it also comes under the category of ‘Super foods’. Here we will be talking about a fruit which also comes under nuts and seeds. It is no other than the wonder fruit ‘Coconut’. Yes, it is a wonder fruit. In our article we will know what is coconut and its health benefits. Coconut is a fruit which grows on palm tree. There are two types of palm tree; one which bears coconut and other which bears dates. The coconut is about 20-30 cm long and three-sided. The outermost part of the fruit is green and shiny when tender. It becomes rough and brownish after its maturity. Slowly, the green husk envelope turns into orange then brown; when it is fully dried the husk is removed and we found round, hard-shelled coconut. The shell has three germination pores or “eyes” that are clearly visible on its outside surface once the husk is removed.The inside of the stony coconut layer is lined with a fairly thick coating of soft, milky-white flesh. The cavity inside the flesh is filled with a watery fluid; it is very tasty and same as the nectar! It is said; one who daily drinks coconut water before 10 am never gets ill and remains healthy. When the fruit is green, this whitish pod is present very thin. The plant grows 30 metre tall with needle type of leaves which are 50-60 cm long. Coconut fruit is believed to be originated in the Indo-Malaya region. It grows well in sandy soil. There is evidence that coconut was grown in India about 3,000 years ago. The Holy Vedas describe coconut tree as Kalpa-Vriksha. According to Hindu mythology, when Lord Vishnu (Protector of universe) came to earth, he brought with him the Karpagavalli or the coconut tree which means giver of all health, energy, strength, tranquillity, longevity and peace. Coconut is widely grown in India, Sri Lanka, Indonesia, Philippines, East Indies, West Indies along with the Islands of Indian and Pacific oceans. 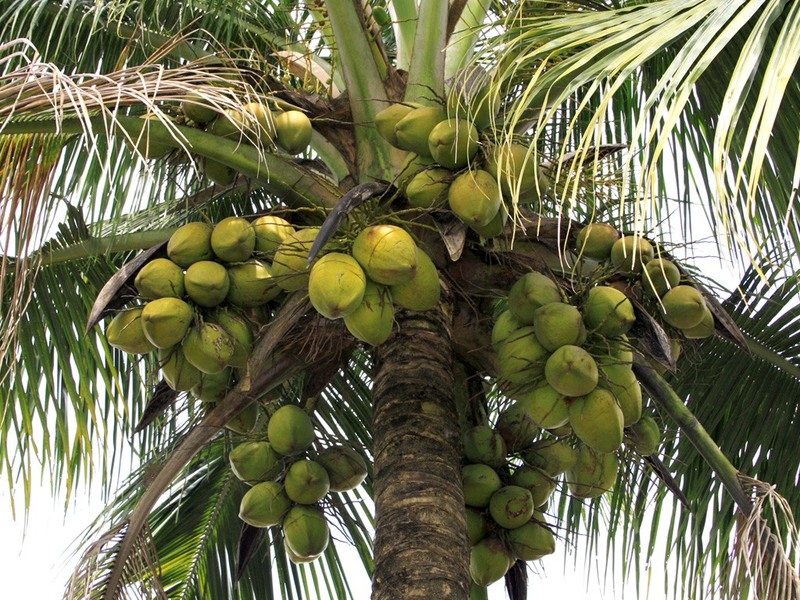 Not only the coconut, but its whole plant is usable in its own way. Firstly, coconut is used to prepare a well-known sweet dessert called “Nariyal ke laddu“. It is prepared in all festive occasions like Diwali and Durga puja. 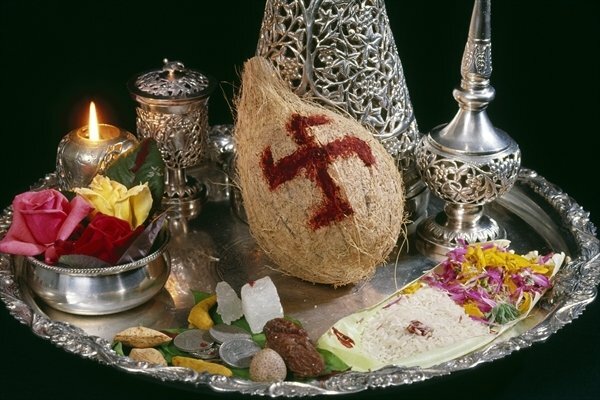 Coconut is highly recommended ingredient in Indian culture and worship. Chatth pooja; which is famous around Jharkhand, Bihar etc; in this husked and shelled coconut is majorly used as a prashad in it. In any kind of inaugural functions, coconut breaking is regarded as sacred. 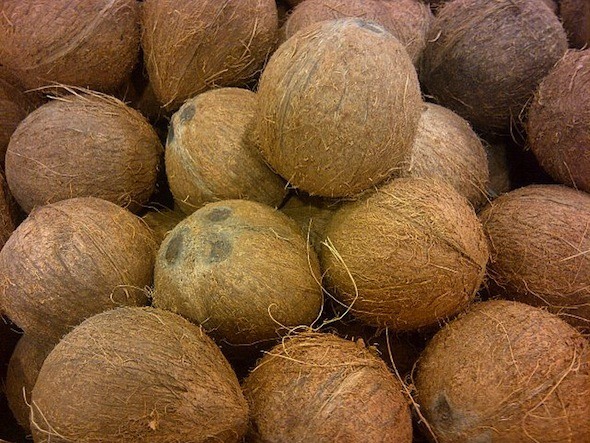 Coconut is the important ingredient in all the South-Indian dishes; curries, chutney and all. Dried grated coconut is used in dessert items like halwa, puddings, ice-creams, sweets etc. Green coconut; is highly beneficial and is used as ‘Nariyal pani’. Inside it has watery fluid which is very beneficial. The milky-white fruit is eaten as a fruit. It is very tasty and tastes like oil. The tough leaves are used to prepare baskets and other things. The husk of coconut shell is used to prepare ropes. Coconut tree is also a kind of ornamental plant. It looks very nice and is planted around parks, gardens, big buildings, apartments etc. Now, lets move to the health benefits of Coconut. Coconut is a fruit which is used in all stages of maturity. As a food, it is most valuable before it matures. Its jelly-like tender kernel contains various enzymes and is easy digestible. The watery fluid present is an excellent tonic for health. Coconut is an ancient and very effective remedy for intestinal worms. It kills all kind of intestinal worms. With breakfast take a tablespoon of freshly grounded coconut. It should be followed by a dose of castor oil after three hours. It should be repeated till the disorder is cured wholly. Coconut oil is very good for acidity cure. Its oil reduces the acid secretion of stomach and gives relief. One who are having such kinds of regular problems; should have food cooked with coconut oil. Tender kernel of coconut is very good to cure disorders related to digestive system. Tender coconut water is also a good thing. It is an excellent remedy for indigestion, colitis, gastric ulcers, dysentery, piles, vomiting etc. It has great medicinal value and is very tasty. There are two types of cough; dry and congested cough. For Dry cough, mix coconut milk with a tablespoon of poppy seeds, milk and pure honey. It should be taken every night before going to bed. It cures dry cough due to throat irritation and excessive cough. Tender coconut water is a good and excellent remedy for Cholera. It should be taken 8-12 ounces of coconut water mixed with a teaspoon of fresh lime juice. It rectifies the electrolyte balance and neutralises the acidosis of blood. It is rich in potassium thus very effective in Cholera. In case of problems like protein in urine, dropsy, kidney stones, heart ailments etc. Coconut water should be taken regularly. It cures all kinds of disorders related to urinary system. In case of Bilious fever, immediate water intake is not allowed. Coconut water is recommended as best for Bilious fever. However, coconut water should not be immediately taken. It can betaken after sometimes; in small small quantity for better results. Coconut water, oil and its pod; all are helpful to increase radiance of skin. In case of Dark circles, coconut oil can be applied as a night cream. It works really good. Coconut oil acts as a natural sunscreen, moisturizer nd erases tanning. It must be applied on body regularly for better results. Coconut water hydrates your skin providing lots of vitamins and minerals. In this disease, there is a swelling in stomach and abdominal region due to fluid accumulation. Coconut water is valuable in Ascites. The patient should be given two or three glasses of coconut water to drink. The quantity may be increased,if required. It cures the swelling in few days itself. In case of burns or itching, directly apply coconut water on the affected area. It is cool and cures itching. In case of wrinkles and blemishes, daily apply coconut oil mixed with raw amla. It is the oil which is suitable for whole year. Coconut and its all products all are highly beneficial for health. So, now what is your opinion about this Wonder fruit! Include this in your daily diet; you can easily get green coconut around your area. With breakfast, include a glass of coconut water. It is the best; not only from taste but from health side too. So, take care and live well!